There can be various factors that may lead to chronic low back pain for example muscles, ligaments, tendons, joints, disks, nerves. The most common causes of acute Low Back Pain is an injury to muscle, ligaments and tendons which is called lumbar sprain or strain. It often occurs because of improper posture. It can vary in intensity from mild annoyance to severe debilitating pain. This type of pain usually resolves within 3-6 weeks, however a few cases may last longer. Other common causes of Low Back Pain include arthritis of the back also known as spondylosis, which can affect, not just the joints but the disks as well. The vertebrae in our back have small joints known as facet joints, which can develop arthritis, much like our knees or shoulders. These joints can become painful and swollen causing back pain and can sometime even press on the nerves nearby resulting in sciatica. One can also have development of bone spurs which may also press on the nearby nerves causing sciatica. Discs in our back are like jelly donuts with a soft jelly filled center surrounded by a layer of fibrinous tissue. 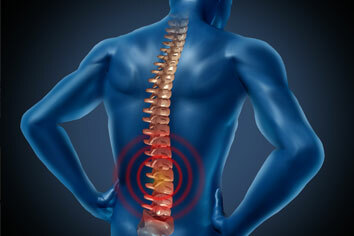 They are located in between the vertebrae, and their function is to provide cushioning and flexibility to the spine. Just like any other structure in our body, these disks can also get damaged due to things like trauma, aging, hereditary factors. Sometimes these jelly donuts can get squished and a small part of jelly can start pushing out (disc herniation) or even completely leak out (disc extrusion). These disc bulges can cause pressure and irritation of the nearby nerves, leading to pain often radiating down the legs known as sciatica. At Integrative Pain Clinic, we have state-of-the-art facilities to provide safe Low Back Pain Treatments for example, epidural injections, nerve blocks, facet blocks, RFA (also known as nerve ablation or rhizotomy), ligament injections, muscle injections, SI joint injections, spinal cord stimulator.